Strawberry Rhubarb Pie has a sweet-tart filling in a flaky, buttery crust that is Springtime pie perfection! Delicious with a scoop of vanilla ice cream! Prepare double-crust pie crust recipe. Roll out one half of the crust and cover the bottom of a pie dish, while reserving the other half of the dough for the top crust. 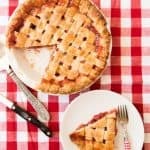 Mix the rhubarb, strawberries, sugar, tapioca, flour, lemon zest and juice, cinnamon, and vanilla together in a large bowl and pour out into prepared crust. Slice the butter into small chunks and place them around the top of the strawberry rhubarb filling. Roll out the remaining half of the pie crust and gently place it over the filling either as a solid crust with slits cut into it for ventilation or by cutting into strips and laying them out in a lattice pattern. Crimp to seal edges. Make an egg wash by beating the egg with 1 teaspoon of water in a small bowl, then brush it over the top of the pie with a pastry brush and sprinkle the top of the pie with a teaspoon or two of sugar. Loosely cover the edges of the pie with foil and bake at 425 degrees F for 15 minutes. Decrease temperature to 375 degrees F and bake for an additional 45 to 50 minutes, or until the filling is bubbling and the crust is a golden brown. Let the pie cool for at least 2 hours before cutting and serving. My favorite basic pie crust recipe can be found here.